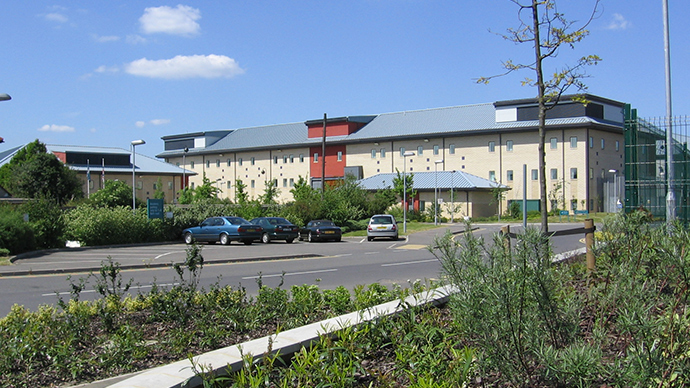 An asylum seeker in Britain’s largest migrant detention center claims inmates have issued authorities with a series of demands, among them the cancellation of a deportation flight to Pakistan scheduled for Tuesday. In an exclusive message sent to RT, Chowdery, who uses an alias, said security in the facility has been stepped up ahead of the flight, in which 100 asylum seekers will be deported. While it is difficult to know how many people are protesting or on hunger strike, he believes it is the majority of asylum seekers. He said the demonstration began in Harmondsworth on March 9, however Ahmad Omid, an asylum seeker from Afghanistan, has told RT it started earlier, on March 7. Chowdery, 23, is a Pakistani who claimed asylum in the UK in November last year because he fears persecution if he returns to his home country. According to his lawyer, Sima Najma of Kher Solicitors, his case has been rejected twice, initially by the Home Office and then by an Asylum and Immigration Tribunal. He is currently in the process of appealing to the High Court. Chowdery has been caught up in a feud since he chose to defy his family and marry a non-Muslim woman from Romania. Najma said he has received death threats from family members, some of whom are high up in government. In addition to his fear of persecution, his legal grounds for asylum also include the belief he will not have “sufficiency of protection” and that he cannot internally relocate within the country. Both of these stem from the belief that if Chowdery returns to Pakistan he will not be able to seek protection from the state because of corruption within the police force. In an email to RT, Chowdery said protesters have issued a list of demands, which include the cancellation of Tuesday’s deportation flight to Pakistan. “One of our demand[s] is to cancel the Pakistan charter which is due on 17th March and treat them as a human,” he added. Abbas Haider, another detainee in Harmondsworth, told RT some 100 asylum seekers would be deported to Pakistan on Tuesday. Other demands include the implementation of a 28 day maximum time limit proposed by a Parliamentary inquiry into migrant detention earlier this month. They also called for the immediate release of all those who are disabled, elderly, pregnant, suffering from mental health problems or victims of torture and trafficking. The controversial DFT system is designed to process asylum claims within weeks, but has left some claimants languishing in detention centers for months. The decentralized nature of recent protests within immigration removal centers makes it difficult to determine the extent to which individuals like Chowdery represent other detained voices. At present, RT cannot verify Chowdery’s position as a spokesperson for those protesting within Harmondsworth immigration removal center.